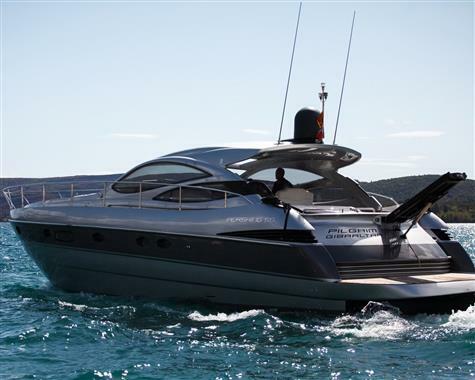 When Pershing tried to take the same attributes of their hugely successful 76 and put them into their 50-footer, it took on a huge challenge. To say they succeeded is an understatement. In fact, the company succeeded brilliantly; this design put Pershing in a class of its own, leaving competitors to play catch-up. The 50 is fast and has timeless styling to match. It's not just her top speed that excites. The 50's acceleration is impressive, with the tachs do a 'digital dance' when you open the throttles. A true performance classic! The surprise doesn't stop there. Inside, in the beautifully crafted accommodation, you are welcomed by the sort of standard you expect to find only aboard large yachts. Classic lacquered cherry is used extensively, contrasting nicely with the curved leather settee and off-white panelling on the bulkheads. Designer Fulvio di Simoni has done a superb job of creating a sense of luxury not often found on sport boats that offer similar performance.